Do anda think Phineas and Stacy would be a cute couple? Who do anda ship Stacy with? Is Stacy your favorit character? Do anda think Stacy should tell Candace to stop obsessing over busting her brothers? a comment was made to the poll: Is Stacy your favorit character? 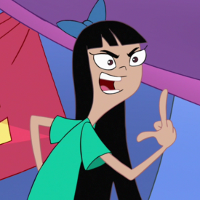 Who did the voice of Stacy Hirano?